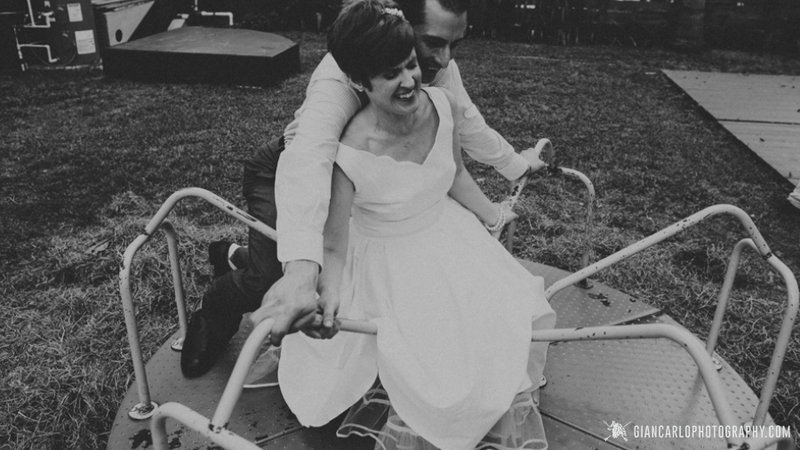 Kelly and Eitel wanted to have a very intimate wedding for all of their children, close relatives and a few of their very close friends. 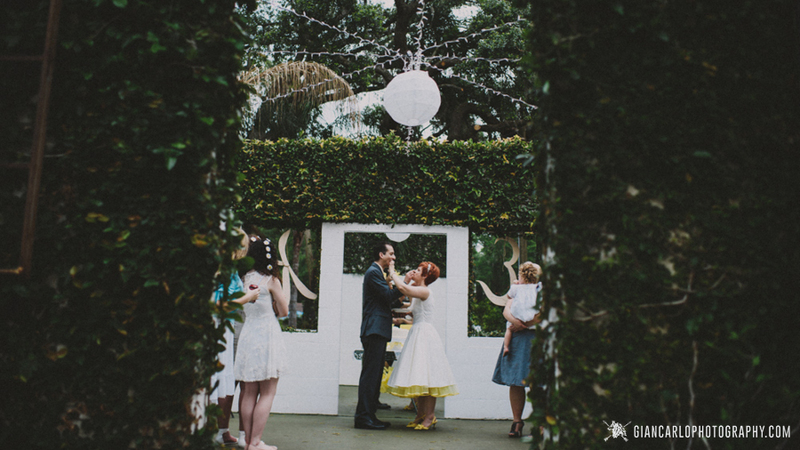 The Acre Orlando provides one of most perfect venues in Orlando for intimate weddings. 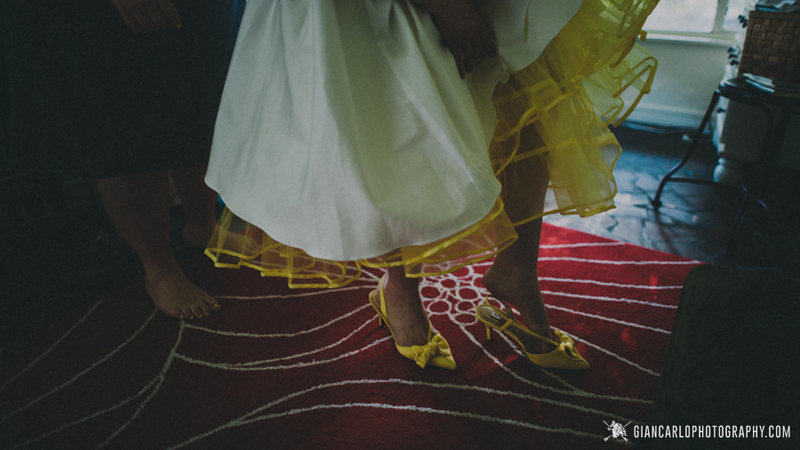 Their wedding theme was 1950s vintage and canary yellow was the predominant color in their decor. All of the decor was DIY and everything was made to feel organic, sweet and cute. 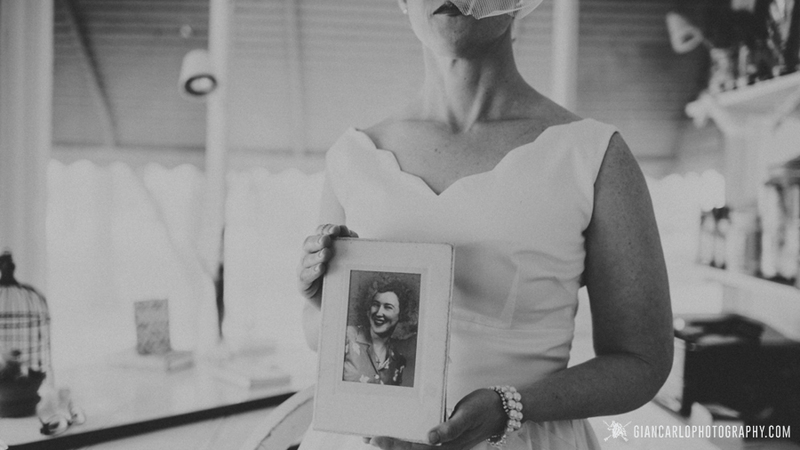 The 1950s vintage style fit their wedding and their personalities perfectly. 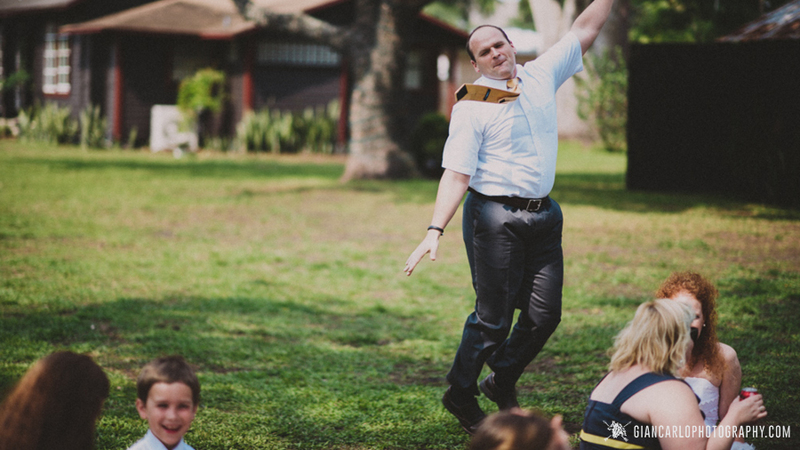 The Acre Orlando’s wide open layout has the perfect atmosphere for a relax, fun and intimate wedding. 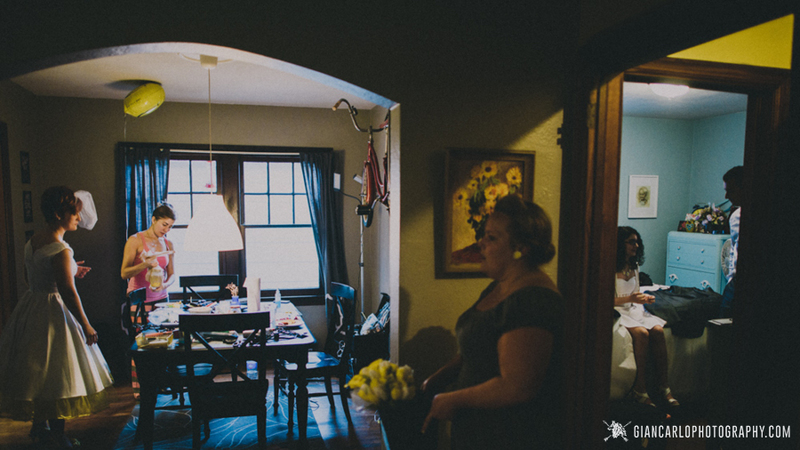 The day started at the brides’ sister house which also has a DIY 1950s vintage style to the decor. The home was full of eclectic and artistic elements that made the place feel warm and inviting. 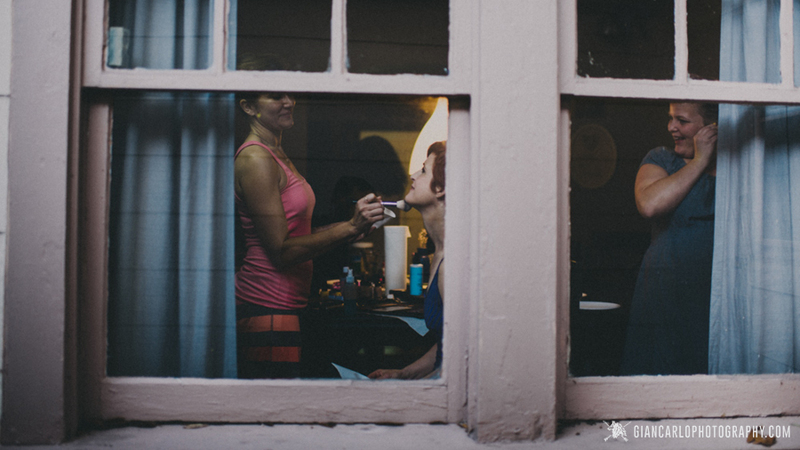 There is something intimate and natural about couples getting ready at home that translates really well in the final story being captured. Kelly wore a 1950s vintage style ivory wedding gown. 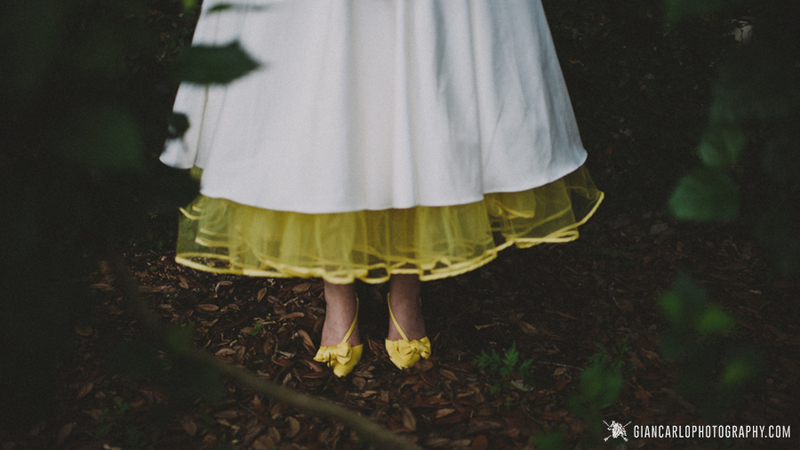 The 1950s canary yellow crinoline that showed below the gown along with the 1950s vintage stiletto yellow shoes, pearls and a beautiful birdcage veil completed a perfect vintage style. The bride and groom decided to do a first look in order to have enough time to do their portraits prior to the ceremony. 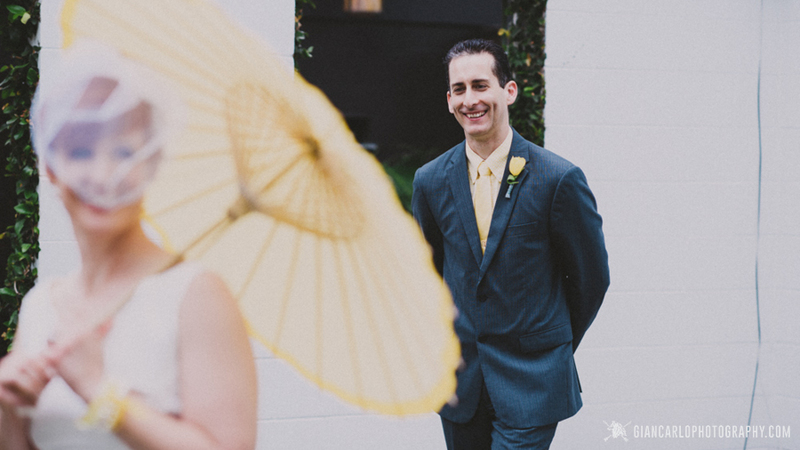 Their first look was fun and playful and it was the bride’s idea to incorporate a 1950s style canary yellow umbrella. Kelly used it to playfully hide from Eitel during the first look which made the moment more fun and memorable for them. 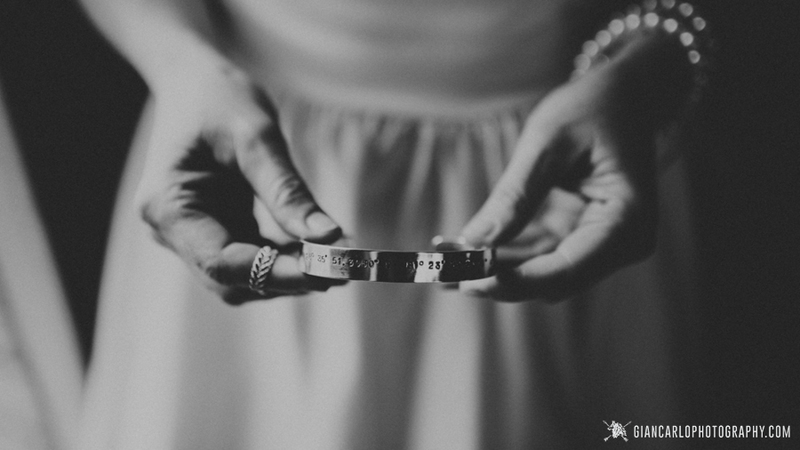 The bride presented the groom with a bracelet engraved with the GPS coordinates to their wedding venue, The Acre Orlando. Their ceremony was perfect and cozy. The flower girls tossed lots flowers for the bride to walk on. Kelly and Eitel’s children were all in the wedding party. 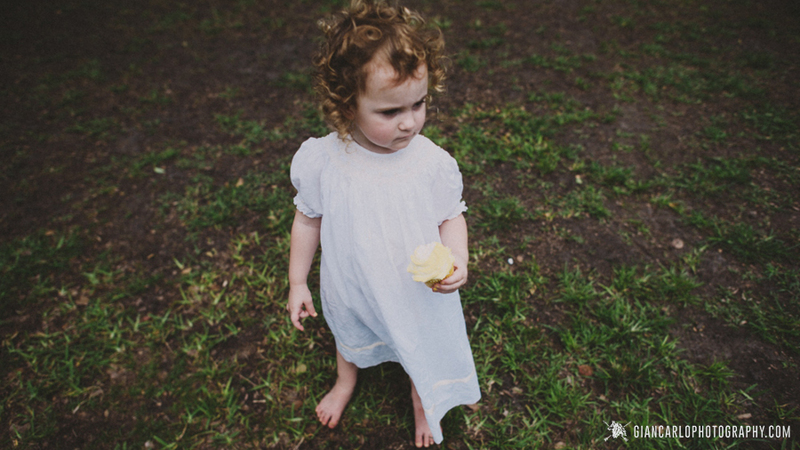 Eitel’s son was the best man and the girls were flower girls and bridesmaids. The girls wore playful daisies arrangements on their hair. Everyone sat in metal benches decorated with knitted blankets. 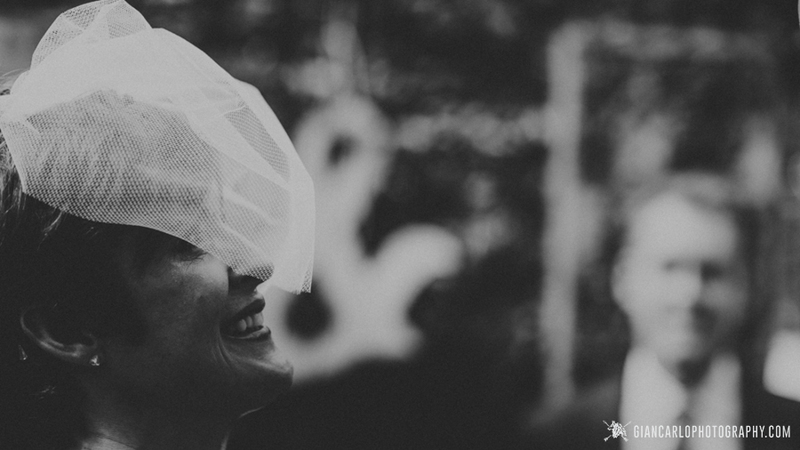 The two families sat together on both sides of the aisle and the ceremony felt very intimate. The bride was super emotional the entire ceremony but specially when she read her vows to the groom. They also gave specially engraved bracelets to all their children as a symbol of their new union as a new family. 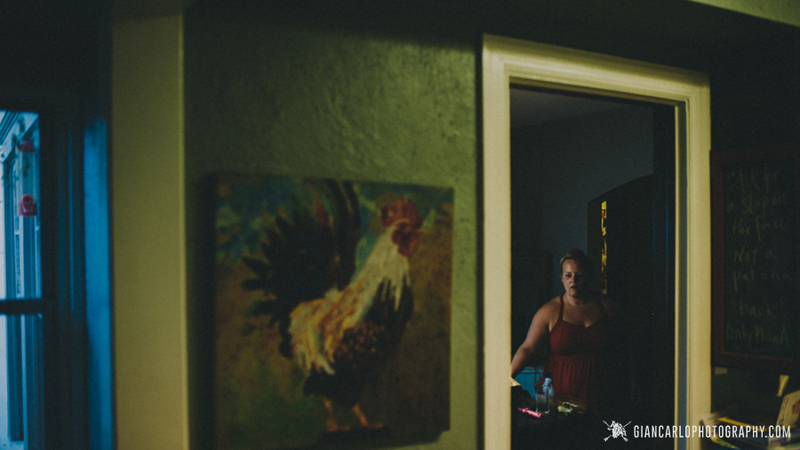 The Acre Orlando offers an array of great locations and light for portraits. I particularly loved the small barn in the back, the open ceiling room with beautiful rustic windows and mirrors. They also have a win bagel truck in the lawn and a beautiful giant cactus. 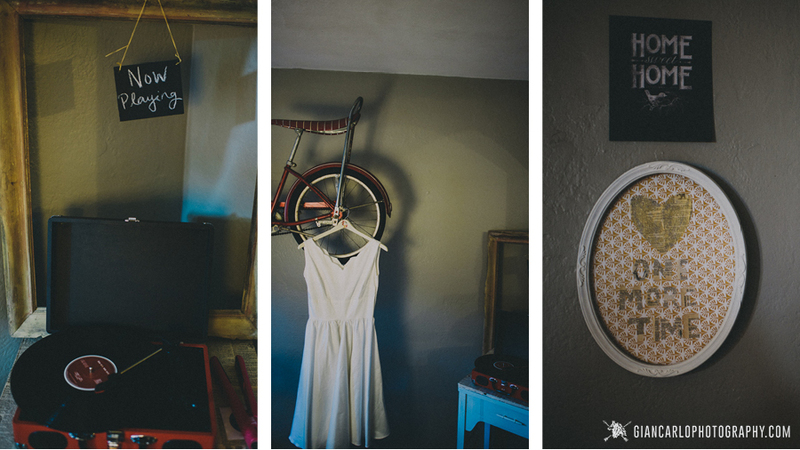 All the decor for the wedding and the reception was DIY. And besides the venue, the make up artist which and myself there were none other vendors that contributed to the wedding. Everyone enjoy sandwiches and other snacks as they sat on their picnic style knitted blankets. The kids and grown-ups including the newly weds had a blast playing on the merry go round carousel thing-y. There was cake cutting and that was pretty much it. 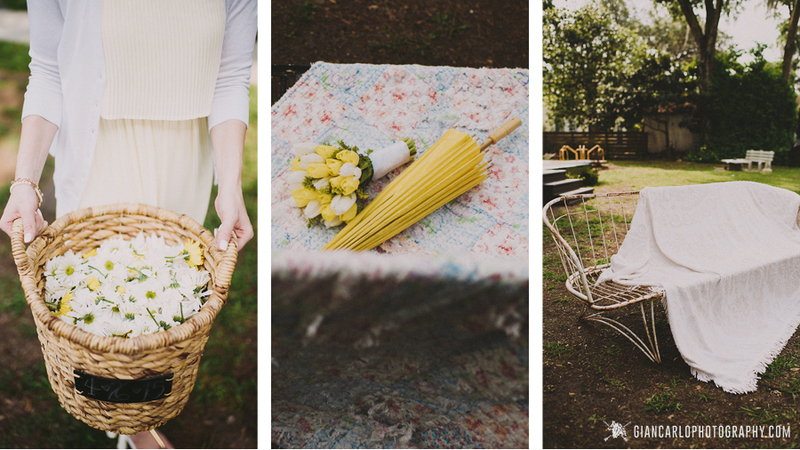 It was very simple DIY Wedding but it was a wonderful ceremony. Congratulations to the bride and groom and thanks to The Acre Orlando. I hope you enjoy the story I was able to captured.